Security Situation In Turkey On November 5 – November 12, 2018 (Infographics) 5.3333333333333 out of 5 based on 3 ratings. 3 user reviews. On November 12, the Turkish Interior Ministry released a new report providing a detailed look at the security situation in the country in the period from November 5 to November 12. 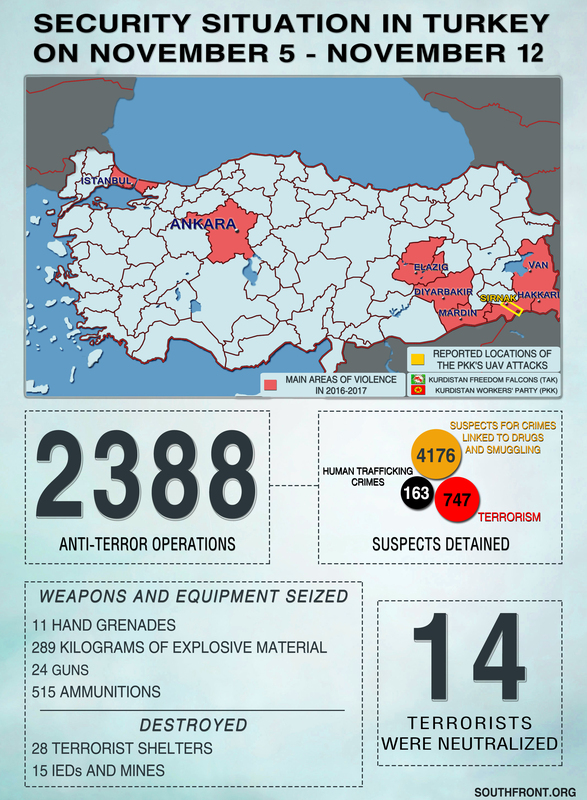 According to the statement, the Turkish Army and security forces carried out 2,388 anti-terror operations across the country “neutralizing” 14 terrorists. The army and security forces also seized 11 hand grenades, 24 guns, 515 ammunitions, 289 kg of explosive materials. Turkish forces destroyed 28 shelters belonging to terrorist cells as well as 15 IEDs and mines. anti-terror means Kurds dont misunderstand. isis is on Turkey payroll…..human trafficing means ‘not official’ trafficing since its a big business for MIT and dont want competition.each day even 1000s of ‘refugees’ from all over the world reach the Greek islands. can you imagine how a single person can travel from Syrian borders and cross all Turkey without a problem? ‘refugees’ even come by airplane to Turkey, nobody asks any questions and just them to Europe…..
TR has more Syrian refugees than all EU combined. These people are running from a bloody civil war, do you support closing of all borders and leave them at the mercy of warlords, armed gangs and various armed forces who bomb everywhere without discriminating civilians from armed groups ? You Greeks are a strange bunch. When it comes to others you claim to be the most humanitarian people on earth, but it is only till something enters your comfort zone and starts disturbing you. what you say is what im saying…..first of all you mention that Tr has millions of Syrian refugges….which is totally true…and what does TR do for that?sends millions to EU. thats official human trafficing my friend. you cant cross such a huge country by hitch hiking. the civil war in Syria is almost ended by now. only small portions of Syria are occupied by foreign powers icluding Turkey. So why dont they return?maybe because they are criminals and cant return, maybe because they prefer to live in EU and receive free ..everything…free house, free benefits whatever?its 1000 times closer to return to Damascus that reach Berlin. why are they in the mercy of warlords? they are in Turkish land now.maybe you mean those remaining in SYria. i answered above. As for claiming to be humanitarian as you say…yes we are because we know what being a refugee means etc. But thats not the case now. we ‘import’ from TUrkey ‘refygees’ from even Cuba….search for Cuba in the map….we are talking about the essence of the term human trafficking here. Furthermore in a country with such a devastated economy its not easy to have citizens living in parks and ‘refugees’ throwing away food or complaining about the luck of places to charge their iphones…….give me a break …no tears for them……what about the rest i mentioned?isnt it true that terrorists means Kurds?and that all kind of fractions in SYria have Tr support?